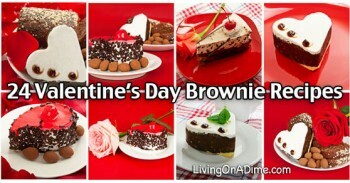 Here are some yummy and tasty Valentine’s Day recipes that will make a sweet treat for your family and friends! Save out 5 cherries and a little of the pie filling for garnish. Divide the rest of the filling between 5 greased 6 oz. custard cups or ramekins. Top each one with a biscuit either rolling the biscuit in the margarine or brush it with it. Mix the sugars and cinnamon and sprinkle on top. Bake at 375° for 14 -17 minutes (until the biscuits are brown). Garnish with reserved cherries and filling. Place everything but the chips into a small saucepan and bring to a boil. Stir constantly and cook for 1 minute. Remove from heat and stir in chips. Pour over cake and smooth out. I’m not sure why the word meringue strikes terror in the hearts of so many, but it really is one of the easiest things to make. I love this recipe for meringue that I got from an elderly neighbor of mine. She said it is totally weep proof and so far I have never had it weep on me, even in the Kansas humidity. I have never seen this Valentine’s Day recipe anyplace else. I hope it works as well for you! One quick tip on meringue — Always make sure your bowl and beaters are grease free. Also begin with your eggs at room temperature. Line 2 large baking sheets with foil and spray with nonstick cooking spray. In a saucepan, mix cornstarch with water. Add boiling water and cook until thick on medium heat. Set aside to cool. Beat egg whites to soft peaks. Add cornstarch mixture and beat until stiff. Add sugar 1 tablespoon at a time until all is incorporated and then add vanilla and food coloring. Drop onto baking sheets by heaping teaspoonfuls and bake at 225° for 45 minutes. Once again, you can divide the meringue and use different shades of pastel food colors (the neon colors are great) for Easter, red for Valentine’s Day, red and blue for the 4th of July, etc. You could also stir in some mini chocolate chips before baking too. Note: This meringue can be used for a pie too. To cut a meringue pie cleanly, butter both sides of the knife. 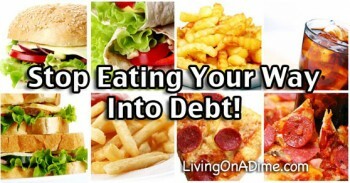 For more money saving recipes and tips to save on your grocery bill be sure to check out the Dining On A Dime Cookbook! I notice that you use a lot of premade things for your simple recipes may I suggest things like make a big batch of biscuits and freeze half on a cookie sheet and then put in freezer bag for later use like the one above, also as with the cherries either buy in season pit and freeze, or buy a frozen bag (a lot less expensive than the can) and make your own filling mix, defrost in microwave with sugar sprinkled on top and add a bit of cornstarch (like as with apple pie) to thicken, and also much healthier and just as cheap to make ahead of time is a universal homemade cake mix, http://busycooks.about.com/od/homemademixes/r/cakemix.htm, that I use with the recipes kept in the container-no added petrochemicals (artificial flavors, colors and preservatives). Thank you Emilee for the tips. If you or anyone else needs more ideas check out the web site and Dining on a Dime. Even though we didn’t in this meal we give tons of making all kinds of making things from scratch and freezing tips along this line. For those of you who have Dining it is full of these types of recipes. When we original wrote the book it was mostly from scratch recipes but over the years we have added others things. the chocolate/cherry cake sounds really nice. I bet it would work with vanilla cake/apple or peach pie filling. 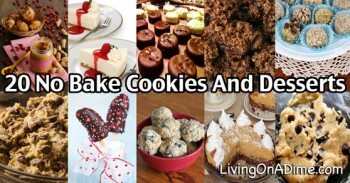 Think I will try both! I bet that would be yummy Donna. Love the sound of the meringue cookies. Maybe substitute almond flavor for the vanilla? How many do you think this recipe would make? I’m going to make them this coming weekend. Just want to let you know I enjoy your newsletters immensely. Keep up the good work. I’m sure you can replace the almond for vanilla you could even replace it with something like peppermint for Christmas and use green food coloring. I’m not sure how many it will make because it depends on how big you make each cookies but 3 egg whites will whip up into quite a bit of fluff to use. I think of you often and read your site almost every day. These recipes sounds just wonderful-yes, they have some convenience items. I believe using this items occasionally is more than fine. “All things in moderation!” The little cherry cobblers would be such a fun surprise for a group of little girls celebrating Valentines Day with all of their cut out hearts and cards. You can be a really fun mom without it taking the entire day, and still make a wonderful memory for someone you love. Happy Valentines to you and Tawra! Hi Barb. How are you doing? This is a really cute idea. I use to love doing tea parties with my granddaughters and this would maybe work good for that too.